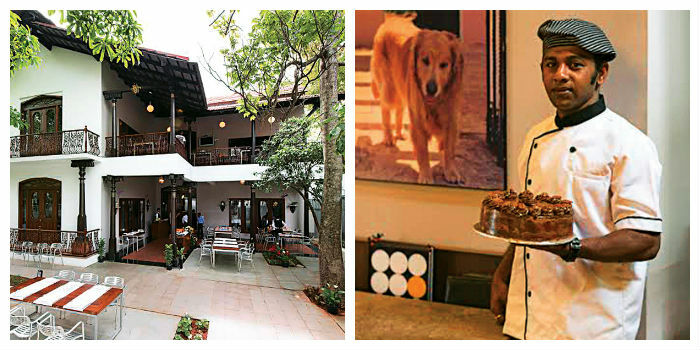 Set inside the cottage of an old-Bangalore bungalow, the new Sunnya��s offers a range of innovations on the menu in the midst of the charming Lavelle Road. Cosy alcoves, a sit-out verandah, a running balcony and a garden area turn into seating areas while high ceilings, a wooden staircase and carved pillars lend it a homely charm. Buzzing in full capacity on a mid-week evening, you bump into old friends as you nibble away on classic favourites. The menu has been redesigned but with the inclusion of all its popular dishes. Regulars need not miss out on their smoked salmon and cream cheese rolls, chicken fettuccine with sun-dried tomatoes or the honey-glazed ham. But there are new surprises in the line-up as well. We decided to go for the new inclusions and began with honeyed chicken wings, fried calamari with basil and lemon and the goat cheese crostini. The wings came in large, juicy chunks, not the skimpy mini versions that are more common. A great balance of sweet and piquant, we even mopped up the sauce with their famous bread. Cooked just right, the calamari went deliciously with its tomato-based dip although we felt that the crostini should be reserved for only the well-seasoned cheese-lover. The mains of chicken breast with sundried tomatoes and the seer fish Anna were satisfying as always, while the clever almond-crusted fish fillet with lemon aioli hit the proverbial spot. A crust of ground almonds and lightly marinated fillet was absolutely scrumptious with the creamy, tangy aioli. Dessert was a trip down memory lane with Barbaraa��s ganache tart and the rum and raisin chocolate fudge. Sunnya��s fans might enjoy the rebalance of the chocolate ganache with more milk and less of the somewhat overpowering bitter cocoa.